The landmark Page Brothers Building is one of two cast-iron front buildings remaining in downtown Chicago. Built just after the Great Fire of 1871, the reconstruction project was part of the Chicago Theatre restoration and now includes office, retail and restaurant uses that share the grand lobby spaces of the Chicago Theater. The economic pro forma required a 50% increase in rentable area. To accomplish these goals, the interior wood structure was replaced with a new concrete one. An innovative construction technique used the old floors as form work for the new concrete slabs allowing continuous bracing of the fragile historic exterior walls. The old structure was then removed leaving an all new building inside the old walls. The basement was excavated, a 5 story light court was filled and a penthouse level was added to increase interior areas per the pro forma . 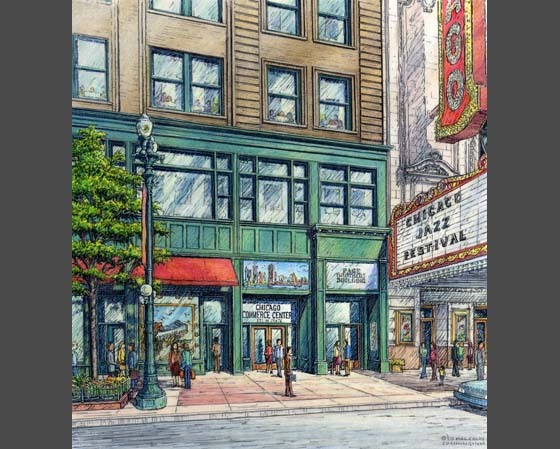 The project is a certified historic rehabilitation and with the Chicago Theater, a winner of the prestigious National Trust for Historic Preservation's Honor Award.